Labour suffered its worst post-war election result as it was beaten into third place by UKIP and the British National Party won its first ever seats in a national election. Labour’s meltdown saw it slump to a historic low of just 16 per cent in the European elections behind the Tories and resurgent UK Independence Party. It is the worst performance by a governing party in a national election since the Liberals were wiped out in 1918. The triumph for the neo-fascist BNP, which will now send two MEPs to Brussels—including its leader Nick Griffin—sent shockwaves through Westminster and increased pressure on Gordon Brown. Labour MPs were horrified that their party’s vote had collapsed so dramatically that it opened the door for the far Right. They said the BNP victory in EU elections increased the likelihood of a new attempt being mounted today to force the Prime Minister out. First projections by the European Union showed centre-right parties would have the most seats—between 263 and 273—in the 736-member parliament. Centre-left parties were expected to get between 155 to 165 seats. With early results coming in, the Tories were on course to win the day with 27 per cent of the vote, with UKIP second on 17 per cent. The LibDems came a disappointing fourth, with just 14 per cent. 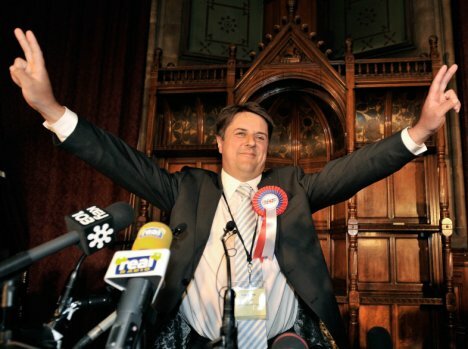 The BNP victory came in the North West region, where leader Nick Griffin was elected an MEP. And in Yorkshire and Humberside, 61-year- old retired lecturer Andrew Brons snatched a seat from Labour as its vote collapsed. Mr Griffin called it a ‘bad moment’ for mainstream parties but a ‘great moment for democracy’. In his victory speech, Mr Griffin claimed there was ‘a deep, dark stain’ on the way the country’s democratic system is run. He said: ‘However much you dislike our party in some people’s cases, you cannot constantly stand by the perversion of the democratic process as a way of trying to keep us out. ‘For the last 50 years, more and more of the people of Britain have watched with concern, growing dismay and sometimes anger as an out-of-touch political elite has transformed our country before our very eyes. Paul Kenny, general secretary of the GMB union, said: ‘On D-Day, Britain sent an army to Europe to stop the Nazis getting here. Earlier yesterday evening, protesters stopped Mr Griffin from attending the election count at Manchester Town hall. Crowds carrying ‘Don’t Vote BNP’ banners and chanting ‘BNP is the Nazi Party’, surrounded his car and other party members’ car, smashing a window, and forcing them to turn around. Mr Griffin was later driven to the town hall in a police van, entering via a back entrance while being heavily surrounded by minders and officers. Labour was beaten by the Tories in Wales for the first time in history and across much of the South, it was pushed into fourth, fifth and even sixth place. In Cornwall it looked to be trailing behind the Tories, UKIP, LibDems, Greens and the Cornish Nationalists. In Edinburgh, Labour was beaten into third place by the SNP and the Tories. If repeated at a General Election, the result would mean Chancellor Alistair Darling being swept from office. Across the country it was a worse collapse than the Tories ever endured, even at their lowest ebb. Mr Brown’s excuse—that governments everywhere were being punished for the economic downturn—was shattered when both the French and German ruling parties scored successes. The only glimmer of hope for Labour was that the Tories appeared to be struggling to make significant improvement on the 26 per cent they scored last time—a worrying sign for David Cameron. UKIP were set to become the big winners as voters furious with the main parties turned their backs on the political establishment. The Liberal Democrats were heading for a disastrous fourth place. Party leader Nick Clegg had been aiming to come second with his pro-EU policies, but the party was facing even worse results than in 2004. The Labour disaster will fuel the alarm of MPs who want to see Mr Brown resign. Rebels said it would be the trigger for a concerted attempt to force a leadership contest. At least one junior minister is said to be ready to resign in a bid to encourage a backbench coup. But Mr Brown’s allies believe the threat of an immediate General Election after a leadership change—which would cost many Labour MPs their seats—will save him. The Prime Minister, battered by the resignation of a string of ministersfaces a showdown with his MPs today in a meeting of the Parliamentary Labour Party. Ringing in their ears will be the words yesterday of Tony Blair’s close friend Lord Falconer, a former Lord Chancellor, and the most senior figure to join demands for the Premier to step down. The Premier rallied Labour activists at a hastily-arranged meeting in East London, joking that although his wife Sarah was not present ‘she hasn’t resigned’. He insisted that the public would not forgive the Government if it turned in on itself at a time when it should be tackling the recession and cleaning up Parliament. ‘What would they think of us if ever we walked away from them at a time of need? We are sticking with them,’ Mr Brown said. ‘We have a purpose, we have a mission, we have a task ahead.’ Crucially for the Prime Minister, new Home Secretary Alan Johnson—tipped as Mr Brown’s successor—warned rebels against mounting a coup. ‘I don’t agree that regicide gives you a united party—quite the opposite,’ he said. Lord Mandelson, who effectively became Deputy Prime Minister in last week’s emergency reshuffle after talking other ministers out of resigning, warned the rebels they had no alternative candidate. ‘It would require someone to raise the standard and say “I would do a better job”â€“ and we don’t have that person,’ he said. But Labour MP John McDonnell said of the European election: ‘If Labour MPs and Gordon Brown don’t get the message from these results we are finished. He added: ‘New Labour is being eliminated at the ballot box. People are telling us that they want the Labour Party to become a people’s party again.